Now for wrath, now for ruin! At its very core, War in the North is a co-op RPG that’s all about the character progression and, let’s not lie here, the loot. Instead of their traditional, top-down dungeon-crawler view, though, Snowblind opted for a third-person view. As a result, War in the North is an action game with deeply integrated RPG elements. 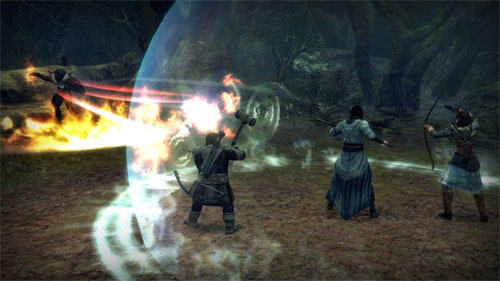 Players use attack combos right alongside their spells and skills, and the blend between the two styles feels quite seamless. The entire game can be played with one to three players (only one of each race is allowed in a given game, however) with the AI filling in the remaining roles. Split-screen, online, and mixed split-screen/online are all supported for the consoles, with just online multiplayer for the PC. Split-screen is a vertical split, which I found to be quite suited for the game (I hardly had to do the lean-in-and-squint at all!). Though online drop-in/drop-out is supported online, I couldn’t find a way for a local player to drop-in/drop-out. The game follows three new heroes in the Lord of the Rings universe: Eradan (the human ranger), Andriel (the elf loremaster), and Farin (the dwarf champion). These three have been tasked with combating a great evil in the north (Sauron’s champion Agandar) while the Fellowship bears the one ring towards the fires of Mount Doom. The plot is fairly simple, but it does the job of coherently connecting the various areas in the game together. The story will lead players through an impressive variety of environments, including (but not limited to) Mount Gundabad, the Barrowdowns, and the Ettenmoors. 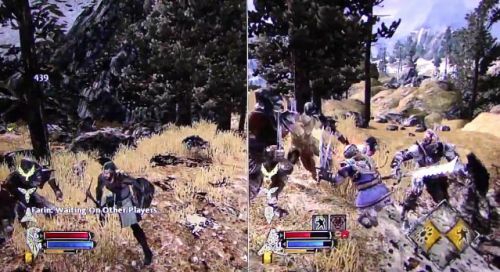 All three heroes are adept in melee and ranged combat, and players will spend much of their time happily thwacking or shooting away at enemies. They also all have the ability to call the Great Eagle Beleram (the fourth, non-player-controllable member of the party) by using the correct consumable. All their other spells/skills, however, are unique from the other classes. Each hero has three different skill trees with four levels. Investing points in any of the skills or passives of a tree will eventually unlock subsequent tiers within that tree. The loremaster, for example, gets a tree that focuses on support and healing, one that focuses on offensive magic, and one that focuses on ranged staff attacks. The ranger, on the other hand, gets a melee combat tree, an archery tree, and a stealth tree. Character customization can get pretty deep as not only do players pick and choose which actives and passives they get, but how many points they want to invest in those skills (some skills only take one point, while others get stronger the more points you put into them). This might sound like you won’t end up with that many skills, but when I ended my first normal playthrough of the game at level 20, I had six active skills and a good number of passive abilities (including one that let me dual wield a staff and sword like Gandalf!). Page created in 0.3432 seconds.